Oliver Sherwood’s 8yo Many Clouds made a highly satisfactory reappearance at Carlisle at the beginning of November when defeating the talented Eduard and Holywell in a class 1 chase, and then ran the race of his life when winning the Hennessy at Newbury four weeks later. As only three winners of this, Kim Bailey’s Master Oats in 1995, Paul Nicholl’s See More Business in 1999, and Noel Chance’s Looks like Trouble in 2000, have gone on to victory in the Gold Cup itself it hasn’t been the greatest guide to success in March. However if all eight turn out on Saturday this years renewal looks the strongest for some years, and certainly contains some potential Gold Cup winners. With three 9yos, four 10yos, and an 11yo veteran collecting in the last ten runnings experience obviously counts. Paul Nicholls has won the race twice over the same period, with Colin Tizzard, David Bridgwater , Jonjo O’Neill, and Nigel Twiston- Davis getting their name on the scoresheet once. While David Pipe and Alan King have failed to win, they have both had two runners placed, King being of particular interest, as he has had only two runners over the period. Course form is important with eight of the last ten winners having previously been successful at the track. ( The other two had strong place form ). The market has been a poor guide with none of the last nine Jollys obliging . Despite failing to win over the course, Smad Place’s Cheltenham record is exemplary. Having been placed in two World Hurdles he ran the race of his career in last years R.S.A. Chase. There, in a race run nearly three seconds faster than standard, he took it up before two out, and hard pressed by the winner O’Faolain’s Boy from the last, in an epic struggle, he only gave best in the last stride. Put away for the rest of the season, he made his reappearance in the Hennessy at Newbury where he started a well fancied 6/1 shot. Although making some progress after the 17th he was never really in the hunt and finished tired, 20l behind Saturday’s opponent Many Clouds. His excellent trainer Alan King blamed himself for the poor showing, feeling that in retrospect, the horse would have benefited from a previous race before such a competitive event as the Hennessy. With very positive vibes now coming from the stable, and with a pull of 12lbs with Many Clouds, his chance is obvious on Saturday. Twice placed, and three times a winner ( including this race last year ) over the course, David Bridgwater’s 10yo The Giant Bolster’s chance must be respected. After his heroics in last years Gold Cup ( 3rd btn 3/4l ) he reappeared at Wetherby at the beginning of November, and ran abysmally finishing tailed off last. He ran with more enthusiasm at Haydock three weeks later finishing 15l 5th to Silviniaco Conti. While further progress can be anticipated back at his favourite track, he is carrying the maximum penalty and has to concede weight to classy animals like Smad Place and Holywell, so perhaps a place is the best that can be hoped for. 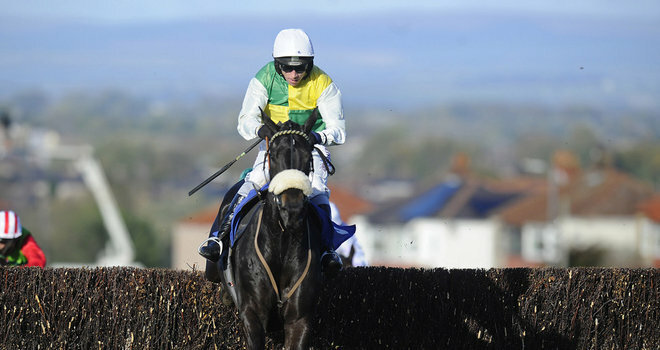 Another set to shoulder the maximum penalty is Many Clouds, and few would argue that he is the animal with most potential in the field. Oliver Sherwood’s 8yo made a highly satisfactory reappearance at Carlisle at the beginning of November when defeating the talented Eduard and Holywell in a class 1 chase, and then ran the race of his life when winning the Hennessy at Newbury four weeks later. He ran out a most convincing winner staying on with great gusto from the last, to win by 3 3/4l from Houblon des Obeaux off a mark of 151, and went into many note books as a potential Gold Cup winner. He is a relentless galloper who stays extremely well and thrives in testing conditions, so should have conditions to suit on Saturday. The slight caveat would be his lack of course form, but he has only run at the track twice, and was going well enough when brought down at the 14th in the R.S.A. Chase. He has shown his versatility on a variety of tracks and I don’t envisage the course being a problem. Paul Nicholls, who has been relentlessly firing in the Saturday winners, saddles the 8yo Black Thunder, an animal who has been slowly getting his act together. A faller in the R.S.A. Chase, he disappointed on his reappearance at Newton Abbot in October but ran well in a cl1 chase at Ascot ( Nov1 ) when a close 2nd off a mark of 149. He then trotted up in a four runner affair when odds on at Sandown. He is another burdened with the maximum penalty on Saturday so perhaps this winner of four of his eight chases may find Saturday’s test beyond him. David Pipes’ 9yo Dynaste stayed on well in the King George V1 chase at Kempton to take 2nd behind his nemesis Silviniaco Conti, giving some encouragement to the view that he has more reserves of stamina than appeared to be the case previously. If this is true last years Ryan Air Chase winner would be a serious contender on Saturday as he ran on so well up that daunting hill in March. Jonjo O’Neill’s Holywell impressed when winning a handicap at the festival of a mark of 145, and progressed again when taking the gd1 novices chase at Aintree by 10l from the very useful Don Cossack, a performance that led to talk of “Gold Cups” by some good judges. However his performances this season have been disappointing, unseating in his last race. Jonjo was badly out of form at the time, so it is far too early to write off this very promising animal. It would be no surprise to see a much improved performance on Saturday.